Lilac shoots collapsing due to infection by Pseudomonas syringae. *Adapted from L.W. Moore. 1988. Pseudomonas syringae: disease and ice nucleation activity. Ornamentals Northwest Newsletter. 12:4-16. Pseudomonas syringae is responsible for a number of economically important diseases in the Pacific Northwest. This bacterium can infect a wide variety of fruits, vegetables, and ornamental plants. Several important factors about these diseases must be considered before control measures can be implemented. This article will focus on symptoms, plant susceptibility, sources, and spread of the bacterium. Once these are known, cultural, biological, and chemical management methods can be effective. A variety of symptoms are associated with woody plants infected by Pseudomonas syringae pv. syringae. Symptoms and symptom development depend on the species of plant infected, the plant part infected, the strain of Pseudomonas syringae, and the environment. More than one symptom can be simultaneously on a single plant. Flower blast: flowers and/or flower buds turn brown to black. Dead dormant buds, common on cherries and apricots. Necrotic leaf spots (entire clusters of younger, expanding leaves may be killed on filbert trees). Discolored and or blackened leaf veins and petioles resulting from systemic invasion and infection. Spots and blisters on fruit. Shoot-tip dieback, which appears as dead, blackened twig tissue extending down some distance from the tip (very common on maples and other seedlings). Stem cankers: depressed areas in the bark, which darken with age. A gummy substance often exudes from cankers on fruiting and flowering stone fruits (this symptom is referred to as “gummosis”). If cankers continue to enlarge, they may girdle the stem and subsequently kill a branch or the entire plant. If the outer tissues of the canker area are cut away, the tissue underneath shows a reddish-brown discoloration. This discoloration may also occur as vertical streaks in the vascular tissue. Shoot tip dieback was the most common symptom observed on 40 woody deciduous plants collected from Pacific Northwest nurseries (Canfield, 1986). 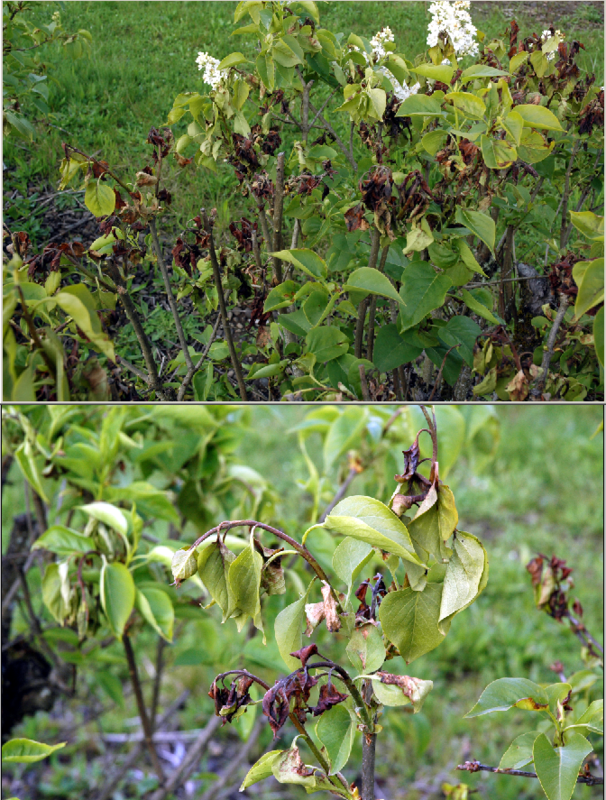 Pseudomonas syringae was isolated from all plants having the tip dieback symptom. Plants most commonly and most severely affected were maple, dogwood, filbert, blueberry, magnolia, lilac, oriental pear, aspen, and linden. This survey of nurseries in Oregon and Washington was not exhaustive but shows the widespread nature of the disease. Reports from Pacific Northwest nurseries help illustrate how variable the severity and host range of Pseudomonas syringae can be. One nursery reported in the spring of 1982 that 30% of 90,000 linden trees showed severe symptoms. Another nursery reported that its linden trees were also severely diseased. However, a third nursery reported that the disease was very serious on Japanese lilac and two cultivars of red maple, ‘Red Sunset’ and ‘October Glory,’ but they observed no problem on linden trees. A fourth nursery reported the disease on Laburnum trees (golden chain tree) and Bradford pear, with 90% of the latter being killed. At a fifth nursery, damage was light to moderate but mostly light and primarily on the leaves of ‘Thundercloud’ and ‘Newport’ plums and on Norway, red, and silver maples. The first leaf symptoms on maples appeared at the start of the second week of May and again the first part of June. In both cases, symptom development was associated with wet, cool weather. Twig dieback symptoms and actual tree mortality did not appear until late summer. This late appearance of decline symptoms may have been due to complications with Verticillium wilt, a serious fungal disease of maple trees. There is no agreement about the severity of diseases caused by Pseudomonas syringae. Most researchers consider Pseudomonas syringae a weak pathogen, an opportunist that capitalizes on a host weakened by some predisposing condition. A number of factors reportedly make plants more susceptible to infection; foremost is freeze damage. Freezing wounds the plant, allowing the bacterium to get into and destroy plant cells. Numerous workers report that symptom development in the field was related to cold temperatures. Ironically, many strains of P. syringae catalyze ice crystal formation on and in plant tissues (Lindow, 1983). These generally are referred to as ice nucleation-active (INA) bacteria. Their presence on the plant serves to raise the freezing temperature above that at which sensitive plant tissues would normally freeze. Most frost-sensitive plants have no significant mechanism of frost tolerance and must be protected from ice formation to avoid frost injury. Ice nucleation activity of P. syringae is conferred by a single gene that encodes an outer membrane protein. Individual ice-nucleation proteins do not serve as ice nuclei, but they form large, homogeneous aggregates that collectively orient water molecules into a configuration mimicking the crystalline structure of ice, thereby catalyzing ice formation. Oriented water molecules freeze at temperatures slightly below zero (-2C to -10°C) instead of supercooling. Wounding Wounding of any kind seems to play a major role in initiating disease development. Wounds may be mechanical or environmental such as frost injury. Wounds have been shown to predispose trees to blossom blight and bacterial canker. Pruning wounds not only allow the bacterium to enter but also aid infection by fungi such as Cytospora and Nectria. Plant Dormancy Dormancy may also predispose susceptible trees to damage from Pseudomonas syringae. Dormant peach trees were reportedly more susceptible to the disease than active growing ones. Soil Factors Factors such as soil pH and mineral nutrition may also predispose trees to Pseudomonas syringae infection. Dual Infections Disease severity is greater when the plant is attacked by more than one pathogen. Diagnosis of Pseudomonas syringae symptoms on maple in Oregon nurseries has been complicated by the presence of Verticiullium wilt. In maple, symptoms of each disease can be similar, and dual infections have been observed. The relative contribution of each pathogen to the total disease impact upon the tree is unknown. There are several potential sources of Pseudomonas syringae; however, the relative contribution of each source to disease development remains unknown. Buds Buds are considered a major overwintering site of Pseudomonas syringae. This bacterium has been detected inside apparently healthy apple and pear buds during both growing and dormant seasons. Cankers Cankers from a previous year’s infection have long been thought to be the primary source of inoculum. Systemic Invasion Pseudomonas syringae has been isolated from interior tissues of fruiting cherry trees; most of these trees typically had three to six cankers, but two showed no visible symptoms. Bacteria were detected as far as 20 ft from any obviously diseased tissue. The highest bacterial counts were from the trunk, roots, and lower scaffold limbs. However, of nearly 10,000 bacteria examined, fewer than 10% were identified as Pseudomonas syringae. In South Africa, bacteria introduced into leaves and leaf petioles during the growing season invaded leaves and shoots of plum and cherry trees and caused disease (Hattingh, 1989). In some cases, disease symptoms do not appear until the following spring. Interestingly, P. syringae strains isolated from the interior tissues of pears in Oregon were not pathogenic (Steve Whitesides, personal communication). Latent Infections Establishment of Pseudomonas syringae inside symptomless tissues during the summer could represent a very important source of primary inoculum. Systemic invasion of tissues by Pseudomonas syringae, therefore, assumes considerable ecological significance and obviously poses a significant challenge to the idea of controlling the disease by applying protective bactericide sprays to the tree surface. For cherry, such sprays have been ineffective in about half the cases and were only 10% to 80% effective in the other half. Epiphytes Pseudomonas syringae also exists on the surfaces of many plants and therefore is in a position to cause infection should the right environmental conditions develop. Monitoring surface populations associated with nursery trees in Oregon showed that the population increased rapidly and peaked during the first 2 to 3 weeks after bud break. The population declined during the summer, increased a small amount in October, and often was undetectable December through February. An antibiotic-resistant strain of Pseudomonas syringae could be recovered from symptomless maple trees for up to 10 months after application, showing that a particular strain of Pseudomonas syringae can survive successfully over the summer and winter. Epiphytic Pseudomonas syringae may be important for survival and spread during the growing season but they may not be important relative to survival and overwintering of primary inoculum. Weeds and Grasses Weeds also can be hosts for Pseudomonas syringae. Workers in Michigan, Oregon, Poland, and South Africa have reported that Pseudomonas syringae was isolated during the growing season from weeds or grasses. Soil It is generally accepted that Pseudomonas syringae survives poorly in soil, but neither the soil phase nor the potential survival of Pseudomonas syringae on roots (the rhizosphere) has been studied in any depth. Pseudomonas syringae can be moved by wind, rain, insects, infested budwood, and transportation of infested nursery stock. Mechanical equipment and pruning tools may be a frequently overlooked means of dispersal or of generating aerosols containing the bacteria. Harvesting alfalfa fields greatly increased the number of INA bacteria captured on petri plates of agar in nearby citrus groves. Pseudomonas syringae has also been recovered from the air above and next to bean fields. A variety of methods have been tested for management of Pseudomonas syringae in commercial plantings. They include cultural management, host resistance, biological control with microbial antagonists, and chemical control. Efforts have been targeted primarily either to control disease or to reduce the risk of frost damage from INA Pseudomonas syringae. However, the results of these efforts have not always been successful. Attempts to alter susceptibility of trees to bacterial canker and/or peach tree short-life disease have included a variety of approaches, each of which has some benefit even though the benefit might be localized to a particular area or soil type. Soil Conditions Liming planting-site soil reportedly promoted peach tree growth and vigor. Altering soil pH affected the susceptibility of peach to Pseudomonas syringae (Weaver, 1975). The nature of the soil at the planting site can affect tree susceptibility in an indirect way. Clay soils typically were free of nematodes in South Carolina, and losses from peach tree short-life in these soils were minimal. Other soil amendments of iron, calcium, and magnesium reportedly affect tree susceptibility to bacterial canker and short-life. Pruning Pruning in fall and early winter also predisposed trees to more severe damage from Pseudomonas syringae infections and the short-life syndrome (Chandler, 1976). Cankers from Pseudomonas syringae infections were longer when twigs were pruned from trees in December than when pruned in January or February. In those cases where trees may be threatened by Cytospora sp. and Pseudomonas syringae, pruning in early spring when trees are more resistant to Cytospora may be of benefit. Summer pruning during dry weather has also been very effective. Cauterization Burning Pseudomonas syringae cankers on limbs of stone fruit trees in New Zealand with a hand-held propane burner cauterized the tissues and limited the canker’s further spread so the branch or trunk did not become girdled and killed (Hawkins, 1976). Living tissue surrounding the burned canker area callused quickly, forming an effective barrier against reinfection, and within 2 years the treated limb showed little evidence of the infection. Cauterization was fast and easy to use in the orchard, and a single treatment controlled most cankers. The method was tested successfully on apricots, sweet cherries, and peaches. This method is part of a total control strategy that also includes a spray program of autumn and winter Bordeaux sprays followed by spring sprays of streptomycin (which is not registered here on stone fruits). Successful control of Pseudomonas syringae has been obtained using resistant plant germplasm. The cherry rootstock F-12-1 is reportedly resistant to P. syringae. Unfortunately, the scion cultivars of sweet cherry are not resistant. But, by budding the scion high on the F-12-1 rootstock scaffold, growers have been able to avoid total death of the tree since cankers usually stop at the graft union. The diseased limb is removed, leaving other limbs to produce a crop. In Germany, some cultivars of sour cherry were observed to be resistant to bacterial canker caused by Pseudomonas syringae. There has been an active program in England to select rootstocks resistant to Pseudomonas syringae pv. mosprunorum. Elsewhere, various peach seedling rootstocks were screened for susceptibility to bacterial canker, and significant differences in incidence and severity of bacterial canker symptoms among six peach rootstock selections were found. Others found that peach tree short-life resistance of Lovell rootstock was correlated with nematode resistance. Nemaguard or Elberta rootstocks were highly susceptible to the nematode and short-life, and some losses occurred even in fumigated soil. Breeding woody trees for resistance is a slow process, both because of the time involved for tree growth and the ability of Pseudomonas syringae to adapt genetically and infect the new germplasm. As a result, plants resistant to this bacterium may be a long time coming. Biological control has been directed almost entirely at frost control using bacterial antagonists to prevent buildup of ice-nucleation-active (INA) populations of Pseudomonas syringae (Lindow, 1983). Many of these experiments have been successful, but in field tests on apple and pear orchards in Washington frost control was not achieved by applying either antagonists or chemical bactericides. There may be an intrinsic ice-nucleation-active molecule within plant tissue not related to the INA bacteria. Fixed copper compounds (such as bordeaux and copper hydroxide), streptomycin (an antibiotic), and coordination productions (such as Bravo CM) are registered and have been used to control Pseudomonas syringae with various degrees of success. Adding spreader stickers to these bactericides has gotten longer lasting control under the cool, wet conditions of the Pacific Northwest. Bacterial resistance to these bactericides, which can limit their usefulness, has been documented. Many nurseries alternate sprays of copper and streptomycin or combine them to reduce buildup of resistant strains and avoid copper phytotoxicity in the spring. Copper compounds have reduced Pseudomonas syringae pv. morsprunorum infections on ‘Montmorency’ sour cherry and have reduced frost injury induced by INA Pseudomonas syringae. A combination copper-streptomycin spray schedule also was used to control pear blossom blast in California. Some growers in Oregon have reported poor control of Pseudomonas syringae following either copper or streptomycin sprays. Because fixed copper sprays gave sporadic disease control of bacterial canker in sweet cherry, it is speculated that the poor control was due in large part to systemic infections. Other failures of control may be due to copper-resistant strains, poor chemical coverage, or inadequate timing as well as to reinfection from outside sources. Improved control of bacterial spot of tomato (Xanthomonas spp.) has been reported from applying a mixture of copper and the fungicides maneb or mancozeb (Conover, 1981). This mixture produces a copper carbamate which is more effective than copper alone and may be useful for Pseudomonas diseases. A mixture of chlorothalonil, copper oxychloride, and maneb, has been registered in the past to control Pseudomonas syringae on tomato (bacterial speck), peach, and nectarine but is no longer manufactured. Soil fumigation to control biological predisposing factors such as nematodes has been successful at reducing the incidence of peach tree short-life. To obtain good disease control, it is imperative to recognize the correlation between susceptibility to bacterial canker and those factors that weaken the tree. Both bacterial canker and peach tree short-life involve similar interacting factors. Recommendations for peach tree short-life include pre- and postplant fumigation of soils carrying threatening populations of parasitic nematodes, use of quality nursery stock with rootstocks resistant to Pseudomonas syringae and to nematodes, attention to soil pH, good weed control, and proper timing of pruning. In addition, the choice of planting site is important as is protection from frost injury where possible through biological, chemical, and physical means. Alternate or mix chemical sprays where appropriate and apply them properly, especially where dual infections of Pseudomonas syringae and fungi such as Cytospora and Nectria occur. Where appropriate, investigate cauterization to limit bacterial canker development, as was done on stone fruits in New Zealand. Baca, S. and Moore, L.W. 1987. Variations in Pseudomonas syringae isolated from grass species occurring in woody plant nurseries in the Pacific Northwest. Plant Disease 71:724-726. Canfield, M.L., Baca, S., and Moore, L.W. 1986. Isolation of Pseudomonas syringae from 40 cultivars of diseased woody plants with tip dieback in Pacific Northwest nurseries. Plant Disease 70:647-650. Chandler, W.A. and Daniell, J.W. 1976. Relation of pruning time and inoculation with Pseudomonas syringae van Hall to short life of peach trees growing on old beachland. HortScience 11:103-104. Conover, R.A. and Gerhold, R.R. 1981. Mixtures of copper and maneb and Mancozeb for control of bacterial spot of tomato and their compatibility for control of fungus diseases. Proceedings of the Florida State Horticultural Society 94:154-156. Endert, E. and Ritchie, D.F. 1984. Overwintering and survival of Pseudomonas syringae pv. syringae and symptom development in peach trees. Plant Disease 68:468-470. Hattingh, M.J., Roos, I.M.M., and Mansvelt, E.L. 1989. Infection and systemic invasion of deciduous fruit trees by Pseudomonas syringae in South Africa. Plant Disease 73:784-789. Hawkins, J.E. 1976. A cauterization method for the control of cankers caused by Pseudomonas syringae in stone fruit trees. Plant Disease Reporter 60:60-61. Lindow, S.E. 1983. The role of bacterial ice nucleation in frost injury to plants. Annual Review of Phytopathology 21:363-384. Weaver, D.J. and Wehunt, E.J. 1975. Effect of soil pH on susceptibility of peach to Pseudomonas syringae. Phytopathology 65:984-989.